Kate Middleton and Prince William have chosen the godparents of their new daughter, Princess Elizabeth Diana! Thanks to the UK version of OK Magazine, the world is able to see photos and a live stream of Princess Charlotte’s christening. The Duke and Duchess of Cambridge exuded happiness as the couple arrived at Sandringham, Norfolk, for the Princess Charlottes christening today, July 5. Prince William walked hand in hand with his son, Prince George, while the entire family smiled as they made their way to the venue for Princess Charlotte’s christening. The family looked dapper as always — Prince William sported a two piece navy suit with a light blue shirt and red tie, while Kate Middleton wore a cream colored Alexander McQueen outfit with a Jane Taylor hat. Prince George wore pair of red shorts with a white shirt, and Princess Charlotte, of course, wore the traditional Royal Christening Robe, designed by Angela Kelly. Hundreds of fans gathered to watch Princess Charlotte’s christening and you can tell from the photos that there was nothing but good energy present at today’s event. Kate Middleton and Prince William also announced who Princess Charlotte’s godparents would be, earlier in the day. The list, which did not include David Beckham, consists of 5 godparents who are all “friends or family.” The list of godparents includes Kate Middleton’s cousin Adam Middleton, Prince William’s cousin Laura Fellowes, Sophie Carter, James Meadem, and Thomas van Straubenzee. The service took place at St Mary Magdalene, Sandringham, Norfolk, and everyone was invited by the Duke and Duchess of Cambridge to send their well-wishes to Princess Charlotte on her christening day. Princess Charlotte’s christening was conducted by the Archbishop of Canterbury, Justin Welby. The official photographer for the event will be Maria Testino, a 60-year-old photographer who took pictures of Princess Diana in 1997, and also took the photos of the Duke and Duchess of Cambridge’s engagement. The amount of history involved with everything from the outfits to the photographer truly makes each and every moment such a special one for the Royal Family. 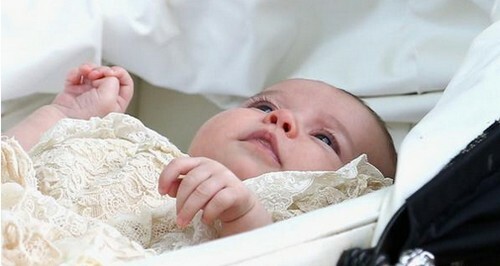 All in all, Princess Charlotte’s christening looks to be a wonderful time for the Royal Family, all of their friends, and even for the fans that attended. Kate Middleton Postpartum Depression Puts Third Baby Plans On Hold: Queen Elizabeth Makes it Worse! Princess Charlotte Elizabeth Diana’s Future Uncertain – What Will Become Of The Spare Heir’s Life? Kate Middleton Won’t Get Pregnant Again After Princess Charlotte – Says No More Children – Third Pregnancy Too Risky? Kate Middleton Starving on Juice Diet: Queen Elizabeth Back To Work Orders Give Duchess 6 Weeks To Regain Perfect Body?